Have a Minute to Save a Life? 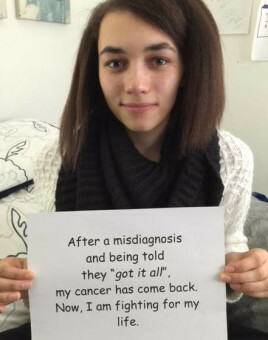 This young 20 year old from the Chicago-land area, is in the fight of her life. She is determined not to use the conventional methods of chemo and radiation to treat her cancer. Her name is Tara Hill. She is a sophomore honors student attending St. Xavier University in Chicago. Her education has always been important to her, but now her focus is on healing from cancer. Tara has Ewing’s Sarcoma, which is a bone and soft tissue cancer. The surgeon she visited at a respectable Chicago hospital told Tara that the mass in her breast is benign; she chose to remove it. After surgery, Tara woke up to the alarming news that the tumor is cancerous and it is in her chest wall. The surgeon expressed to her that they removed the entire tumor; but after reviewing the surgical reports, it was confirmed that they did not. Tara reasoned to cure herself without the help of conventional doctors by changing her diet to a completely raw, organic diet. After she began college, she ate as any college student does; she ate a lot of sugar and less veggies. Regrettably, 18 months later the cancer came back. It continued to grow quite large and measures to be 8-1/2″ x 6″. It is located in and around her right breast and chest wall. The recommendation of the doctors are to remove her breast, part of her chest wall and part of her lung, along with high doses of chemo and radiation. “Without these treatments”, they say, “You will surely die”. “I knew for sure that I could not poison myself with the harsh drugs and devastating side effects from chemo and radiation“, Tara says. “Because I saw many family members die horrible deaths due to conventional methods, I want to give myself a better chance at survival”. Faced with this situation, what would you do? How much are you willing to do to save the life of your young daughter? Tara and her family’s decision to do what is best for her survival comes at an extremely high cost. Her parents have taken out loans, emptied 401k plans, and any retirement and savings accounts. They are working around the clock at multiple jobs and still are not close to what Tara’s treatments cost. The whole medical and financial situation is frightening to Tara. However, through faith, the power of natural treatments, and her supportive family, Tara is determined to use alternative methods and is willing to fight for her life before agreeing to chemo, radiation, and more surgery. First on Tara’s list is to choose a natural doctor to assist her and her family and provide them with resources that empowers her to participate in this healing journey. Continue reading Have a Minute to Save a Life? Posted on March 21, 2016 Author kdafa2Categories Cancer Treatment, Cancer Type, Chiropractic Adjustments, Detox, Diet, Healthy Lifestyle, Integrative, Massage, Somebody You Should Know, SupplementsTags Colonics, Ewging Sarcoma, Hyberbaric Oxygen, Infrared Sauna, Integrative, IPT Insulin Potentiation Therapy, IV Vitamin C, Ketogenic, Lymphatic Massage, Organic, PolyMVA1 Comment on Have a Minute to Save a Life?